Recycle your empty inkjet cartridges to help protect the environment and raise money for charity. It’s so easy. All you have to do is register and choose who you want to raise money for. You will receive freepost recycling bags and can send back up to 5 cartridges at a time or desktop recycling boxes for larger volumes. Inkjets fit in the palm of your hand and have a circuit board and jet plate on the bottom. It’s cartridges that have circuit boards that have a recycling value when empty. The circuit boards are patented and cannot be made from new, so an empty must be found and refilled in order to make an alternative to the full OEM product. Please use the search box to find out if your inkjet cartridge is wanted. Each wanted cartridge that is recycled will raise £1 for your chosen charity or other not for profit organisation. We offer the most comprehensive wanted list in the industry! Makes you can recycle include HP, Dell, Lexmark, Canon, Samsung, Neopost. Please do not send Epson or Kodak cartridges in our recycling bags as their value will not cover postage costs, instead you can include them in a box collection if you have at least 25 items. 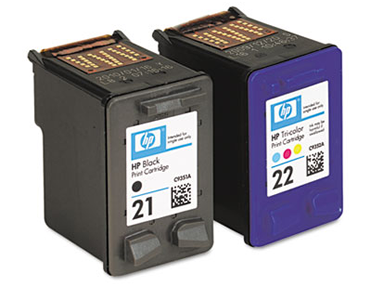 Inkjet cartridges must be in suitable condition to be recycled. Please check our recycling criteria. Only virgin cartridges on our wanted items list raise money for charity when recycled. All inkjet cartridges must pass a visual inspection & electrical test. "Virgin Cartridges" mean cartridges which have not been refilled before and carry only the original equipment manufacturers branding. We do not accept laser & toner cartridges through this recycling service. To recycle these items, please click here for an alternative environmental solution.